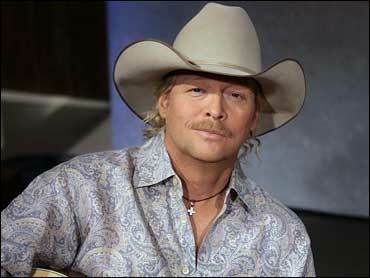 Back when he was starting out, Alan Jackson felt mighty lucky to be nominated for a Country Music Association award. And today, 20 years into his career? "I feel mighty lucky to get nominated," he says with a laugh. Jackson, 50, was up for male vocalist as well as album of the year, song of the year and video of the year for "Good Time" at Wednesday's CMA Awards. The show airs live on ABC. "To be honest with you, I've forgotten what all the nominations are" this year, he said aboard his tour bus recently. "I think over the years I've won everything I qualify for." That's a safe bet as Jackson has been nominated 79 times, more than any other artist in CMA history, and he's won 16. But these are his first major nominations in a few years. Last year he had only one nomination, for musical event. His last CMA wins were in 2003, when he took honors for male vocalist, vocal event and entertainer of the year. The Newnan, Georgia, native said he doesn't think about his dry spell. "I've learned to just enjoy it and don't worry about winning them or losing them. I'm glad to be included." Jackson is in an elite group of country stars. He's sold 50 million albums and had 33 No. 1 singles. He writes most of his own material. His latest album, "Good Time," is something of a comeback. His 2006 release, "Precious Memories," was a gospel disc that he recorded as a gift to his mother. While it sold well, radio didn't play it. That year he also released the Alison Krauss-produced "Like Red on a Rose," a collection of romantic songs that drew critical praise but enjoyed only modest success by Jackson's standards. With "Good Time," he's back in familiar territory. Two singles - "Small Town Southern Man" and the title track - reached No. 1, and the third, "Country Boy," is No. 15 and climbing on Billboard's country chart. "Small Town Southern Man," which was partly inspired by his father, was Jackson's first No. 1 since 2003's "Remember When." "I wanted to put 'Good Time' out as the first single," Jackson recalled. "I'd had a lot of heavy stuff out there. Not since 'It's 5 O'Clock Somewhere' did I have kind of a fun thing. But everybody at the label said it sounds like you and it's what radio expects and they felt that would be a good platform to launch the album, and I think they were right." Jackson isn't the only interesting story at this year's CMA awards. Kenny Chesney is the lead nominee with seven and is seeking his third straight - and fourth overall - entertainer of the year award. If he wins, Chesney would tie Garth Brooks for most wins. Also nominated are Brad Paisley, George Strait, Sugarland and Keith Urban. Female vocalist. Carrie Underwood, who is co-hosting the show with Paisley, is going for her third consecutive win. She's up against Krauss, Miranda Lambert, Martina McBride and Taylor Swift. Vocal duo. Brooks & Dunn are nominated for their 15th award in this category. They'll have to top Big & Rich, Montgomery Gentry, the Wreckers and last year's winner, Sugarland. Vocal group. Rascal Flatts has had a lock on this award the past five years. They're nominated again with the Eagles, Emerson Drive, Lady Antebellum and Little Big Town. Single of the year. Trace Adkins has his first CMA nominations in 10 years for single of the year and video of the year for "You're Gonna Miss This." For single, he's up against Chesney ("Don't Blink"), Lambert ("Gunpowder and Lead"), Strait ("I Saw God Today") and Sugarland ("Stay").